The location of the expanded trail has been flagged and is currently being cut for the placement of the concrete forms. 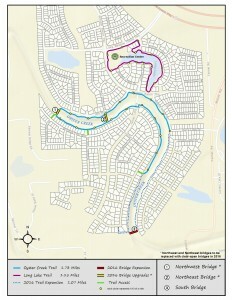 The location for the new trail was selected in an effort to balance privacy for adjacent homeowners while complying with criteria and standards required by Texas Parks and Wildlife Department (TPWD), who provided grant funding, and other entities with jurisdiction in the area. Other location considerations included minimizing damage to existing vegetation, access by mowers and maintenance equipment, and the potential for high water events. The additional one mile of trail will meander along the creek through the native trees providing residents with enhanced strolling, walking, and running opportunities. The contractor on the project will move from the east bank to the west bank in the next few days as they work cutting the location for forms. Contingent upon weather, concrete pouring may begin as early as the end of next week. Demolition of the western most bridge is nearing completion and the other bridge will remain open until the new west bridge is complete. The prefabricated bridges are on order and delivery is expected in approximately 10 weeks. Installation will take place upon delivery. Who takes care of our street lights? Cobrahead style street lights in the District are operated and maintained by CenterPoint Energy. Each pole has a unique identification number that can be used to assist CenterPoint Energy in a more efficient response to a reported outage. To report a street light outage, District residents may call CenterPoint Energy at (713) 207-2222. Or you can visit their website and complete a simple form to report the outage.